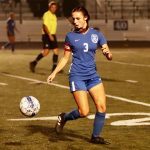 The first week of October has traditionally been a positive week for the Liberty Girls soccer program, where the hard work of the season which typically features at Top 10 strength of schedule in Division I starts to pay dividends. This year’s Pattys squad has faced their fair share of challenges, but with three straight wins and a perfect first week of October things are coming together at the right time. 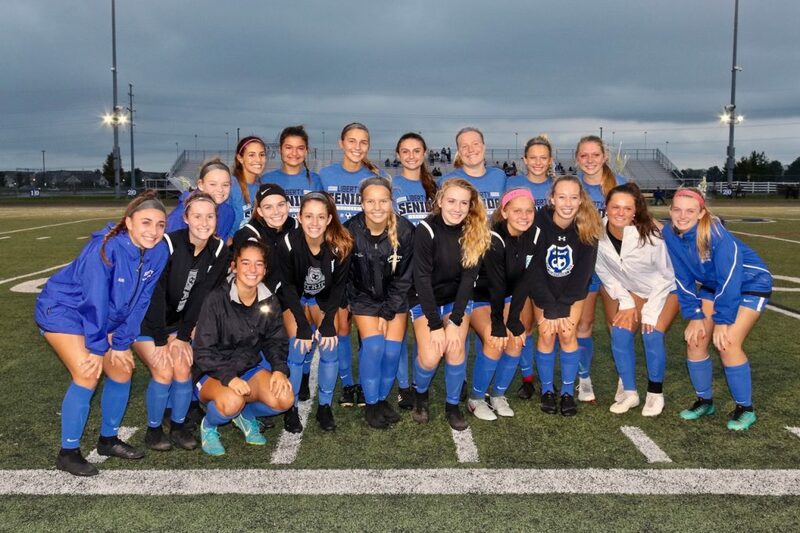 The past week featured a 1-0 OCC Buckeye Conference win over Westerville Central on Tuesday and one of the strongest performances of the season on Thursday in a 2-1 Win over the Central Region’s #6 ranked Gahanna on Senior Night. In addition, the JVA and JVB programs also had an undefeated week, with JVA winning 2-0 on Thursday vs. Westerville Central, and JVB winning 1-0 vs. Westerville Central on Monday, and 5-0 vs. Olentangy on Wednesday. Coming off a conference win at Westerville North the previous Thursday, Liberty was looking to secure its 2nd straight conference win to pull the OCC Buckeye record up to 2-2-0 on the season. 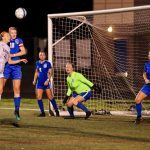 The Pattys delivered in a match that did not see a lot of scoring opportunities for either team, but when the Patriots best opportunity arose in the 48th minute they converted. 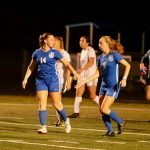 Senior Captain Lynsdey Kijowski worked out of trouble and maneuvered around 3 defenders with some nifty footwork, played a through ball down the flank to Junior Emma Lindsey who beat her defender to the end line and drove a pass near post. 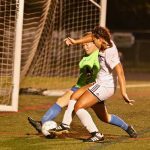 Gia Gaetano got a foot on the ball drawing two defenders and the Goalkeeper’s attention, and when the carom was not smothered Senior Laura Bichsel collected the loose ball and finished the game winner with authority. The entire defensive unit led by Riley Cartwright, Jasmine Hauser, Caitlin Curmode, Addi Moeller and Victoria Susi turned in a solid effort to secure the shutout. 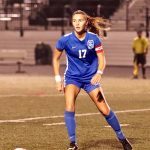 Senior Captain Lyndsey Kijowski anchored the central midfield and was complimented by the referee after the match for her work rate and leadership on the field. Senior Night came on Thursday with high hopes to deliver a win against the Central Region’s #6 ranked team Gahanna Lincoln. The Pattys program celebrated its seven seniors, Laura Bichsel, Captain Mara Follmer, Gia Gaetano, Jasmine Hauser, Captain Lyndsey Kijowski, Emily Milisaljevich, and Riley Cartwright. The evening was even more emotional for the entire squad as Junior Maddie Kelley played her last game before a pending family move. Liberty stunned the Lions early when in the 7th minute Kijowski won the second ball in a 50/50 challenge, pulled the ball back and served a drop pass to Gaetano who hit a bomb from 25 yards out into the Upper 90 to take a 1-0 lead. However, 2 minutes later a Gahanna forward was fouled inside the penatly area and awarded a free kick from the penalty mark, which was barely converted past the diving Cartwright. The 1-1 score would hold through the balance of the first half. 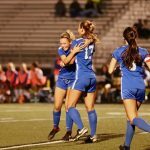 The Pattys came out in the second half facing a stiff wind but determined to win the game on Senior Night, and wasted no time in securing the game winner. Off of the opening kickoff of the second half, Liberty connected seven passes resulting in a through ball from Gaetano to Bichsel, who ripped a 20+ yard shot from the right flank over the goalkeeper’s head into the side netting barely 30 seconds into the half. 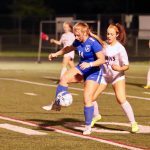 For the balance of the game, the Patriots controlled play, were patient and cohesive as a defensive unit, and other than a flurry of 3 corner kicks in the final 2 minutes by Gahanna, the Pattys subdued the Lions attack. Another strong performance by the defense and entire team effort resulted in one of the best complete performances of the season. The final week of the season features matchups against two top 10 regionally ranked squads, with district rival #4 Olentangy away on Tuesday and facing #1 Watterson at neutral site Otterbein at 8PM on Thursday. The Pattys will also learn their tournament path after this coming Sunday’s district tournament draw meeting. Congratulations to all of the Seniors, the video of the Senior Night Ceremony can be found HERE.